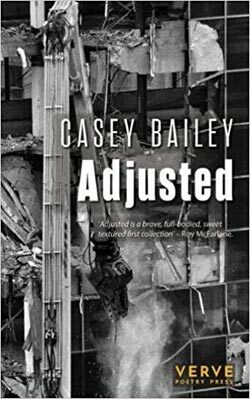 There's no better poet to feature in outsideleft on National Poetry Day than the indefatigably magnificent, Casey Bailey. Look... it's no hyperbole to say that Birmingham is a city spoiled for poets. Whilst maybe it was never seriously nearly the city of culture, the city surely would have a shot at being the City of Poetry. In Bearwood - Birmingham adjacent, at the ground zero incubator for definitely up and coming poets, the Why Not Coffee shop, you'll hear talent that will simply take your breath away, make you smile and cheer too; you will be entertained and by mere kids --in some cases, more able than poets I have driven halfway round the country to hear, a feature of Amerah Saleh's monthly Why Not Words poetry evening. It was at the inaugural Why Not Words that we first encountered Casey Bailey, headlining the evening and closing out the show to a hushed, hushed audience hanging as if by a thread from his every word. It was remarkably brilliant. Casey Bailey is a man so gifted he can simply do whatever he wants with words. But whatever he does, it will stop you in your tracks. His clarity has actually hushed us all. Casey works with words of course, but keeping your head above water as a poet means working hard too, in Education in his case. Casey works a lot with teens and his insights, from the support and the back and forth with those kids informs the mic. As Casey performed from his two books, the tempo and timbre of his voice as he rhymed was just so gorgeously measured. He found a way to rhyme about growing up in Nechell's, and about mental health in minority communities. In 'Spirit' he talked about losing a friend and challenged the given wisdom that suicide is somehow the cowardly way out. OUTSIDELEFT: A little about where you are from what you do for money? I never think there's much money in the spoken words unless you're a therapist? CASEY BAILEY: I am an Assistant Vice Principal at a secondary school in Birmingham, and even though this is what pays the rent, I don’t like to think of it in these terms. Just like my involvement in poetry, I teach because I love it. OL: Is Why Not coffee shop, a sort of uncommon ground for poetry? How do you feel about presenting your work there? What sort of places do you typically perform? CB: It’s not an uncommon ground for poetry, poetry is classically found in spaces like cafes, bars and other relatively small communal spaces. For that reason, I think I will be very comfortable. OL: When was the first time you stood up and read? CB: The first time I stood up and read my poetry was about 4/5 years ago at BeatFreeks, Poetry Jam. OL: When did you begin to think 'this could work!' Have you always written, always been a observer? CB: I have always written, when I was 10 years old I was writing songs and lyrics and poetry have been spilling from my pen ever since. I’m still never sure that it does work, but I keep pushing on. OL: What do you prefer, writing or reading (your work)? CB: This is a difficult question to answer. I think I get more of a release from writing my work, it is a cathartic experience and I tend to feel better when I complete a first draft of a poem. On the flipside, I get more joy out of performing and receiving feedback that my work has had an effect on others. OL: You work with a small poetry press, do you find because they are small they are nimble and can innovate in ways that perhaps larger publishers cannot? CB: I work with a new poetry press, with a small but very dedicated and passionate team. I can’t compare Verve to larger poetry presses as I have not worked with them, but I can say that I am ecstatic with the level of support and care that I receive. OL: Poets, musicians you admire? CB: Poets I admire include Amerah Saleh, Hannah Swings, Bethany Slinn and Raymond Antrobus (amongst many others), go check them out. They’re great! ...leads one to saying nothing at all. Award winning artist Kate Groobey talks about her show Pure Pleasure at the IKON. And other stuff too. Lisa Germano perces the curtain on sleep and creeps you out in the cuddliest way possible.